Quiet Studio located in residential neighborhood within walking distance to La Jolla's scenic cove, beaches, restaurants, shops, and art galleries. Come enjoy the peaceful Couples escape with relaxing garden & fountain. A short walk to locals favorite Windansee, Marine Street Beaches and the La Jolla Cove. Beautiful sunsets and coast line with coastal walk for your enjoyment. Approximately one block from Tennis Courts, track, and pool. New Hardwood flooring and tile. Owners live in the Front house and are well versed in dining, shopping, water and athletic activities and other nearby attractions. We love to meet new people and entertain. With the Studio being behind our home, it gives us an opportunity to help people enjoy their vacations that much more by interacting and offering suggestions for where to take a coastal walk, shop, eat, etc.. Walking distance to La Jolla Cove and Wind n' Sea beaches where you can picnic and watch the sunset or jump in for a swim; many fabulous restaurants and shops in easy walking distance; quiet residential area. THe TV is for Viewing DVD's only. No local channels or cable channels are received. Basic Cable channels only on TV. This rental is plenty big enough for 2 people and is just as pictured in the photos. It was very clean and comfortable. The ceiling fan provides good air movement. We did not need air conditioning as the climate in La Jolla is generally very pleasant year around. We had a few issues with our stay and Danna was very quick to respond and did her best to rectify our problems. She was friendly and wanted to provide us with a good experience. We arrived 30 minutes after check-in and discovered the cleaning crew still in process. They were not expecting us until the next day. I called and confirmed that our arrival date was correct. The cleaners left about 20 minutes later and we settled in. We did experience some noise issues with the upstairs tenants. On a Friday afternoon there was a great deal of noise from a hide and seek game...I know this because they repeatedly counted to 25 and then ran throughout the apartment. I did mention the noise to Danna and she said she would let them know about the complaint. We did not hear an excessive amount of noise after that. The next morning, there was no hot water for showers. We called and they responded by resetting the on-demand water heater and believed it was fixed. We did not attempt to use the shower again that day. The next morning, we attempted to take showers and again discovered no hot water. Unfortunately, that was our travel day and we did not have time to wait for repair. The owners did offer to let us use the shower in the main house but we declined due to our tight schedule to get to the airport. I do not know that I would return to this property, but I do believe that the owners will have the hot water problem resolved for the next guest. They were very kind and left us a bottle of wine to help make up for the rough spots. We felt safe in the neighborhood, there was adequate parking and the grounds are lovely. I liked the lemon and orange trees on the property. I am appreciative of their approachability and their attempts to rectify our problems. We really enjoyed our stay the place was all we needed. A few minor things could use some updating tho like the frying pan is terribly warped, the BBQ has hot and cooler spots and the grill on it is rusty, one of the blind panels was duct tapped on and fell off, and the outside light was too dim to BBQ as one night we had a late dinner my husband had to place a flashlight in his ball cap to see. We did mention to the husband there abou the light but nothing was done about it. But all in all we enjoyed it! The location is great easy walking to everything we needed. stay very pleasant. Certainly would recommend. Only thing stopping a 5 star review is the old furniture. 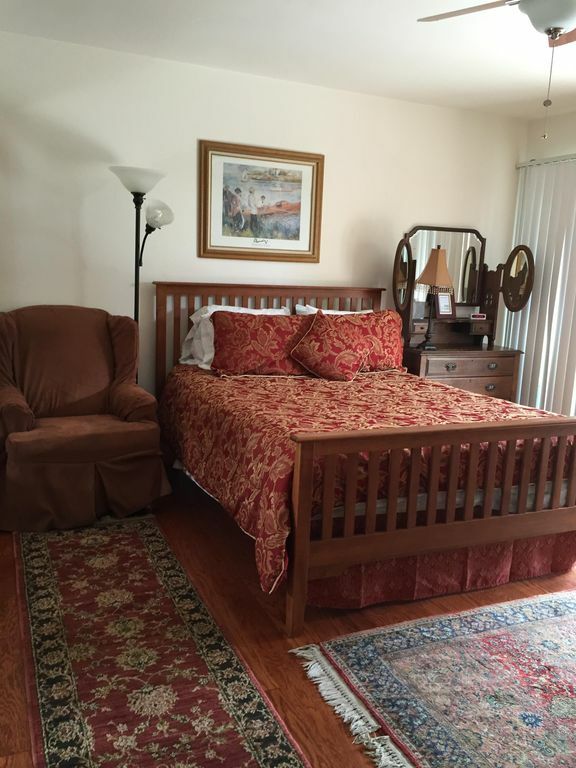 Splendid studio apartment in perfect La Jolla location! We stayed 3 nights and found it perfect for our purposes. Really, it couldn't have been better. An alcove off the large bedroom is the kitchen. The bathroom is roomy enough for 2 and has a terrific shower. It's airy and well ventilated with a multi-speed ceiling fan. Especially nice are the art items on the walls, which are both lovely and uniquely intriguing. The location in a quiet neighborhood is an easy walk from everything that's fun in La Jolla, from multiple beaches to restaurants to shopping. We enjoyed breakfasting at local highlights and lounging with tea at sidewalk cafes. The public bus system — we didn't rent a car — is inexpensive, clean and pleasant, easy to use, and goes everywhere. (We took the bus to visit several sites in San Diego.) The hosts are welcoming and helpful. We'll definitely return to this little gem! Studio with full kitchen. In residential neighborhood, middle of LaJolla village. Owners live in adjacent house on property. But totally private. Outdoor area. Simple, all amenities, very comfortable. Walk to village and to coastal walk. This is a terrific place. It is in a great location and the owners are very helpful. They were very accommodating, and they gave us great recommendations for places to eat. The studio is nicely appointed and it has everything we needed for the kitchen, bathroom etc.